In addition, we work with lenders of your choice to help you go solar. Commercial Solar: For commercial solar systems, we have lending rates as low as 5 percent and 8-14-year commercial lease-to-own solar financing available. 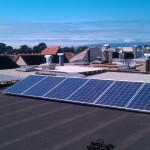 Residential Solar: We offer a variety of solar power leases for residents with FICO scores as low as 600. You can benefit with zero down payment and electric bill savings from day one. FAQs: This page contains Frequently Asked Questions about solar financing, solar panel cost and the Frequently Given Answers we provide about leases and agreements.